The peak and gradual decline in world oil production is beginning to spawn a set of geopolitical positive-feedback-loops that seem likely to exacerbate depletion and accelerate the effective rate of decline of world oil production. Rather than isolated incidents, these geopolitical feedback loops are the direct result of geological peaking in oil production. Unlike geologically driven peaking, however, the effective rate of decline caused by geopolitical feedback loops has the potential to continually accelerate. This post will lay out a theory to better understand the impact of this system of geopolitical phenomena. I've discussed the impact of various types of geopolitical disruptions to oil production previously at The Oil Drum. One of these geopolitical phenomena, the Export Land Model (ELM), has been well developed by TOD members Westexas and Khebab (see their Iron Triangle post and Wikipedia article). While I think that ELM is already proving to be the most significant of the geopolitical factors--especially in the earlier phases of peak oil--I think that it is important to place ELM into the context of a larger set of geopolitical pheonomena. In part, this is the case because of a similarity between the various geopolitical forces at work. In part, it is because these forces tend to act as alternatives to one another, and their full implications cannot be properly understood in isolation. In this post, the first part in a series, I hope to lay the framework of a theory for better understanding these phenomena, for extrapolating trends, and for predicting their future impact. It is also important to place the problem of geopolitical disruptions in context, and to highlight the danger of dismissing these phenomena as isolated and separate "above ground factors." The next post in this series will review and update the set of geopolitical feedback loops currently in action, looking not only at disruptions to oil production, but also at the larger issue of resource production, including gas, coal, fertilizer, metals, etc. The final post will discuss the interrelationship between the various geopolitical forces at work as well as the potential approaches to "solve" this system of problems. 1. Are Geology and Geopolitics Separate? When considering peak oil, it is tempting to look at the issue as a purely a matter of depletion due to geology and production economics. While peak oil certainly begins with the study and understanding of geological depletion, it spawns a set of exacerbating geopolitical factors that are critical to understanding the ultimate scope and impact of peak oil. Some commentators consider "above ground factors" to be separate, stand-alone phenomena that are neither related to nor driven by the geological peaking of oil production. This is a critical mistake. Rather than being merely isolated phenomena, these geopolitical forces are best viewed as phenomena that would not exist but for geological constraints. Without geological constraints on oil production--specifically without geographical constraints on where remaining viable oil reserves are located--oil producers would produce sufficient oil from geopolitically stable locations. In reality, resources are almost always subject to uneven geographical distribution. For economic and political reasons, consuming nations tend to produce domestic supplies first. When consuming nations produce oil in foreign nations, regions with geopolitical stability and stable legal systems to protect property interests are favored, so oil from these countries tends to be produced first. As a result, when the world has produced roughly half of its reserves, and when world production approaches peaking, the majority of remaining reserves (especially the majority of economically viable reserves) tend to be located outside consuming countries in the least geopolitically and legally stable regions. This, roughly, is why "our oil" is increasingly likely to be located "under their sand." As a result, today's increasing geopolitical problems in oil and resource production are a direct result of geological factors combined with picking the low hanging fruit first. If it had made more sense to produce oil from offshore Nigeria, Azerbaijan, or the Arctic first, and save Texas and Alaska oil for later, we would have done that. But because that wasn't what made sense, today's geopolitical problems are a direct result of geography when viewed from a macro perspective. Additionally, this process of explaining why geopolitical problems exist today also demonstrates that it is useful to view geopolitical problems as a global system of phenomena, not as isolated events. 2. Are Geopolitical Disruptions Feedback Loops? It seems that geopolitical forces act as positive feedback loops. I'll detail the feedback inside and between various geopolitical forces in my next post, but for now I'll outline the general concept: 1) global scarcity of oil, energy, or other resources increases the likelihood of disruption to the supply of that resource (for various reasons that I've discussed before and will outline in more detail in the next post in this series); 2) when these disruptions occur, they further increase the global scarcity of the resource, increasing the effect noted in #1 and creating a positive feedback loop. * For that reason, I call this set of exacerbating factors "geopolitical feedback loops" as they are subject to positive feedback both from their own operation and from the rate of geologically-driven depletion. I think that term is appropriate, but admittedly a bit cumbersome--I'll shorten it to "GFL" for now. *Some GFLs may not be positive feedback loops--the Export Land Model, for example, is probably a positive feedback loop to the extent that the drop in net exports from one exporter causes global prices to rise enough to make that exporter's export revenues increase despite the decline in net export volume. However, it would be a negative feedback loop if the rise in domestic consumption due to high export revenues (the system's output) has the result of decreasing export revenues (feeding the system's output back into the system in an inverted manner) and thereby causing a decrease in domestic consumption (acting to re-establish equilibrium). 3. How Does the "Rate" of Disruption from Geopolitics and Geology Compare? There are also critical differences between the rate of geological depletion and the potential rate at which geopolitical disruptions cumulatively impact oil supply rates. Unlike depletion, whereby oil production from a given field or set of fields decreases rapidly after peaking before beginning to "tail off" and decrease more slowly (the black line in the graphic above), geopolitical forces may disrupt production catastrophically, or may disrupt production at a rapidly accelerating rate (the red line in the graphic above). This is not to say that GFLs will have a greater impact than geology--while it is certainly possible that a single geopolitical disruption will dramatically outpace geological depletion over a short time period, geological factors will likely be the main determinant of oil production declines during the initial phases of peak oil. However, depending on our society's ability to mitigate Peak Oil with substitute energy sources and to adapt to a lower energy world, it also seems likely that geopolitical disruptions will eventually overtake depletion as the most significant problem. Because geopolitical disruptions will have a disproportionately greater impact in an environment of increasing oil scarcity, as well as due to factors involved in secondary and tertiary recovery methods, the right half of the global oil production curve will not look like the left--when the impact of GFLs are added to the rate of geological decline, the drop in global oil production may be much faster than generally expected. 4. Along What Timeline Will Geopolitical Disruptions Unfold? Geological forces do not require an actual peak in global oil or energy production to begin to form positive feedback loops--rather, the catalyst for positive feedback is the onset of diminishing marginal returns in investment in energy, where energy begins to become more expensive in relative terms. While global oil and energy supplies may not have peaked, we have almost certainly crossed the threshold of more expensive energy. Also unlike depletion, geopolitical feedback loops may disrupt production in a region that is still far from geological peaking. For this reason, it is reasonable to expect GFLs to increasingly disrupt global oil production alongside an increase in the scarcity of oil, and before an actual peak in global production. Annecdotal evidence supports this view of the the timing of geopolitical disruptions: while some degree of scarcity of oil has coincided with geopolitical disruptions in the past, increasing scarcity over the past decade has coincided with easily observable increases in geopolitical disruptions. While I think the general issue of timing is obvious, one critical unanswered question remains: how fast will geopolitical disruptions impact overall production rates? 5. Will the Aggregate Effect of Geopolitical Disruptions be Smooth or Unpredictably "Bumpy"? Unlike geological depletion, geopolitical disruption is uniquely susceptible to "black swan" events--things that simply cannot be predicted. This is problematic because, unlike geological depletion which can be understood as a slow but compounding process, geopolitical disruptions may appear non-existent, but then suddenly exert a huge toll on global production. This makes predictions of future oil production levels even more uncertain than predictions that account for only geological factors, and increased uncertainty in estimating future oil production makes selecting and mobilizing the necessary political will for various mitigation options more difficult. Some GFLs, such as the Export Land Model, will likely produce fairly smooth and predictable effects. Others, like the increased motivation to target oil production infrastructure, will likely produce relatively smooth aggregate effects, but will be subject to significant and sudden disruptions--for example, if al-Qa'ida successfully destroys the export terminal at Ras Tanura, or if Iran blockaded the Strait of Hormuz. The critical unanswered question here is whether, in aggregate, the impact of GFLs will be predictably smooth (as assumed in the graphic at the top of this post) or unpredictably volatile. 6. Is the System of Geopolitical Feedback Loops Solvable? Because individual geopolitical disruptions can be "solved", there is a tendency to think of them as separate from geological challenges (and thereby a convenient alternate explanation for those who don't like the implications of geological depletion). Additionally, there is a tendency to think that because individual problems are solvable, the system of geopolitical forces can also be solved as a whole (specifically, solved by the same tool-set of security, military force, etc.). In reality, while the occurrence of individual events and geopolitical disruption in individual regions is highly uncertain (and too complex to predict mathematically), the increasing scarcity of oil and other resources caused by geological factors creates an ever increasing catalyst to geopolitical disruption. In the face of geological depletion, geopolitical disruption is not a question of if, but a question of where and how fast. If a single geopolitical disruption--say, a militant group attacking a pipeline--can be solved, why can't the larger system also be solved? In theory, it can, but there are systemic problems to solving the larger system. In general, this is because the "solutions" to the individual problems are actually to overwhelm and repress the root cause locally--something which will become increasingly difficult globally. For example, the Nigerian rebels can, theoretically, be defeated by overwhelming government force, but this does not solve their grievance--that their ethnic group is being oppressed and resources that are rightfully theirs are being appropriated. Rather, it relies on overwhelming military force and expenditure to repress it (and, it should be noted, this "solutions" is being discussed theoretically, as the massive military force and expenditure by Nigeria's government at present is failing miserably to repress rebel attacks on oil infrastructure). It seems, at least to me, far more likely that the world can concentrate resources to temporarily repress geopolitical flare-ups regionally, especially in the earlier phases of peak oil. However, if global resources are spread thin, it is impossible to address every trouble spot simultaneously. Because of this, it seems unlikely that there would be enough pressure at individual points to repress disruptions across the entire system. Finally, while many geopolitical problems can be repressed by favoring one side in a dispute as leverage against the other (the Exploitation Model), it is often not fundamentally possible to actually resolve the issue by making all parties happy (thereby eliminating the root cause of the geopolitical disturbance) because the minimum demands of opposing groups are often mutually exclusive. I've written about this problem of Mutually Exclusive Overlap before, and I think that it makes the global system of geopolitical feedback loops an inevitability. However, while I think that the broader system is not "solvable," I do think that it is possible to buffer their effect, a topic I will discuss in a later post. 7. Is Price the Sole Catalyst of Geopolitical Disruptions? While demand destruction and economic troubles may grant a temporary reprieve from increasing geopolitical tensions (because they may temporarily reduce the underlying catalyst of scarcity), the steady march of resource depletion will eventually catch up and cause geopolitical tensions to escalate again unless a truly economical, scalable substitute for fossil fuels is built out sufficient to negate depletion and accommodate continued economic and population growth. In that sense, if peak oil is not a problem for humanity, neither will we suffer the exacerbating effects of geopolitical feedback loops. However, to the extent that peak oil presents a serious problem, it will be increasingly exacerbated by geopolitics. Additionally, demand destruction is particularly inefficient at buffering these geopolitical feedback loops because the lowest value consumption tends to be "destroyed" first. In a demand destruction scenario, when consumers are forced to reduce consumption out of economic necessity, they will choose to first eliminate the consumption that is least necessary to the maintenance of their quality of life. As a result, as demand destruction gradually decreases consumption, the consumption that remains is, by process of elimination, increasingly inelastic. For this reason, demand destruction actually exacerbates the positive-feedback nature of these geopolitical phenomena. A pipeline bombing, cartel action, or rise in domestic consumption that removes 500,000 barrels of oil per day from the international market exerts far more leverage on a future United States that consumes only 10 million barrels (due to demand destruction) per day of oil than it does on today's United States that consumes roughly 20 million barrels per day. However, if this same future United States only consumes 10 million barrels per day of oil due to the development of economically viable substitutes and voluntary efficiency measures, then this would not be the case. I'll address this point in more detail in my discussion on buffering GFLs in a later post. In general, if scarcity is the underlying catalyst to geopolitical disruptions, I think that price is not the best indicator of that scarcity--rather, price of a barrel of oil as a percentage of purchasing power parity may be more appropriate. 8. Are Geopolitical Feedback Loops "Scale Free"? A scale free system (aka a fractal) is one that exhibits the same behavior at all levels. Do GFLs operate as a scale free system? Assuming that, at a point in the future where total oil production is rapidly declining, there would be a world wide catalyst for geopolitical disruption to oil supplies, would it also be true that a region where oil production is rapidly declining will see a regional catalyst before world supply begins to decline? The answer is still unclear. Mexico, for example, is already well beyond its peak in oil production--ahead of the global process of peaking. Does this mean that internal pressures in Mexico are greater than elsewhere, that the driving forces behind geopolitical feedback loops are greater than elsewhere, or that the attacks on Mexico's gas pipelines can be attributed to GFLs being more advanced in Mexico than elsewhere? We don't know. In theory, it seems reasonable to suggest that a country experiencing the problems with its own early peak may experience greater geopolitical pressures than others, but it is far from clear that this is the case in Mexico where oil export revenues are still rising, and where there are ample alternative explanations for the gas pipeline attacks. Additionally, other countries where production peaked well before global production (e.g. the US, Norway, UK, though arguably not Indonesia) haven't experienced a localized rise in geopolitical tensions. There are many complicating factors (especially when viewing the US and UK and their position on the world stage), but this is a possibility to keep track of as some regions progress past peak before others. 9. How Should Quantitative Data be Integrated in this Model? One criticism of this model of geopolitical feedback loops is, quite understandably, its lack of hard, quantitative data at its base. In one sense, the subject matter is fundamentally less suitable to quantitative, data-driven analysis than the core issue of geological depletion. Some exceptions stand out--the Export Land Model, mentioned above, is a prime example of a geopolitical feedback loop that is well suited to data-driven analysis. Even ELM, however, presents problems for data-driven analysis. For example, when an exporting state that currently subsidizes domestic fuel prices decides to cut that subsidy when export revenues begin to decline, or if a state decides to buy domestic political support by using some of its export revenues to boost subsidies, how do we integrate the impact of this fundamentally political maneuver with the more pure analysis of net export declines? Similarly, it is quite challenging to gather accurate data of nationalist sentiment (and the degree to which this sentiment may lead to violence), the ability to mobilize political will to conserve resources for future generations, the degree to which resources motivated a military "adventure"--all of these demonstrate the challenge of bringing data-driven analysis to inherently "fuzzy" topics. Perhaps the most important question is the degree of importance of data-driven analysis to this topic. Will the quest for mathematical analysis of these topics provide more predictive power for a given amount of effort, or will it create a misleading appearance of accuracy and predictive ability while actually creating faulty conclusions? If quantitative analysis is appropriate here, how, specifically, should it be carried out? This question, in particular, is one where I hope the many TOD readers with experience in this area will weigh in. I plan to begin to introduce some quantitative data in the next post in this series by attempting to tally the amount of production currently shut-in or otherwise disrupted due to the various categories of GFLs around the world. I expect it will be difficult to accurately track this data over time (at least when compared with our ability to track actual oil production), but it seems like the best place to start with quantitative analysis, and may provide some insight into the rate and timing of geopolitical impacts on oil production. 10. Is the Potential for Financial Crash a Geopolitical Feedback Loop? It's purely artificial to separate the financial impact of peak oil from the geopolitical impact--in fact, there are broad areas of overlap between the realm of finance or macroeconomics with geopolitics. How should these issues be integrated into this model, if at all? It is unclear to me whether financial markets are an exacerbating or mitigating factor in the context of broader geopolitical disruptions. In one sense, the financial turmoil caused by high oil prices makes it more difficult to raise capital necessary to exploit new technologies, develop substitutes for oil, and to produce more economically challenging oil reserves. Likewise, price volatility and peak oil combine to exacerbate both financial and geopolitical issues. However, it can also be argued that financial turmoil mitigates the geopolitical problems of peak oil by destroying demand and reducing scarcity (though, as mentioned above, this is a double edged sword because it may increase inelasticity of the remaining demand). I hope that readers can propose the best way to integrate models and predictions of financial turmoil (such as Gail the Actuary's recent financial market predictions) with this model of geopolitical feedback loops. I've recently finished the book "We Think" by Charles Leadbeater. This book is an outstanding discussion of the advantages and pitfalls of collaborative innovation. I'm not proposing that the theoretical framework I'm setting forth in this and later posts is in any way gospel truth--it is an initial effort to tackle a very complex system of problems, and certainly needs further development. The Oil Drum is, in many ways, an ideal example of a "we-think" collaborative environment, and I hope that the amazing breadth and depth of knowledge of TOD readers will help to further develop this theory. Developing a better understanding of the impact of a system of geopolitical feedback loops in resource production is a critical first step in both improving our ability to predict future energy and resource supplies, and in understanding how to best act to mitigate resulting problems. Hopefully my answers to the above questions begin to lay out a foundation for a broad theory of geopolitical disruption to resource supply. In the next post I will look at several discrete geopolitical phenomena within this analytical framework, but for now my hope is to start a discussion of the overarching issues raised in this post. How can you double something and still have ten times less than you started with? The answer to this question will help us reassess claims that advances in oil field technology will postpone the peak in global oil production. The question itself arises from a case study of Enhanced Oil Recovery in the Handil Oil Field in Indonesia. 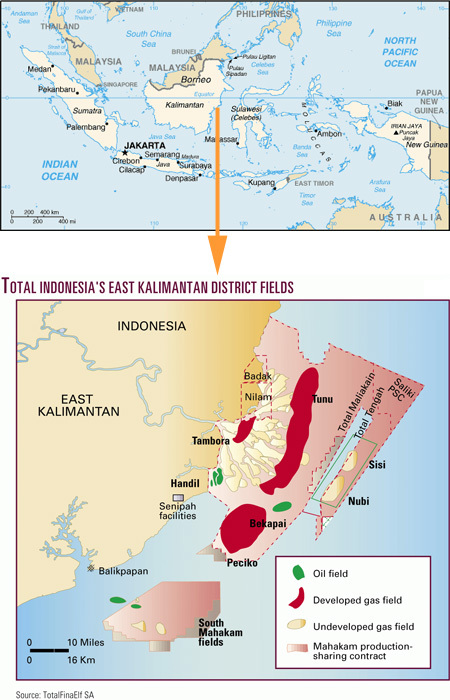 Handil is a giant oil field in the Mahakam Province of Indonesia, discovered in 1974 and still operated by 'TOTAL Exploration and Production Indonesia'. The International Society of Petroleum Engineers had a feature article on 'Reviving the Mature Handil Field' in the January 2008 addition of their Journal of Petroleum Technology . The Handil field comprises 555 unconnected accumulations (reservoirs) in structurally stacked and compartmentalized deltaic sands. The reservoirs are trapped by the Handil anticline, which is cut by major impermeable fault dividing the field into two compartments: north and south. The reservoirs are between 200 and 3500 metres subsea and cover an area 10km long by 4km wide. Pressure on the fluids in a reservoir rock causes the fluids to flow through the pores into the well. This energy that produces the oil and gas is called the reservoir drive . Gas Depletion Drive: In the subsurface, the oil is under high pressure and has a considerable amount of natural gas dissolved in it. When a well is drilled into the reservoir, pressure in the reservoir decreases and gas can bubble out of the oil which can form a gas cap. Dissolved gas drive is very inefficient and will produce relatively little of the original oil in place from the reservoir. While this drive mechanism is commonly used to produce gas fields, rarely would it be relied upon for oil production. Water Drive: Water Drive reservoirs are driven by water adjacent to or below the oil reservoir. The produced oil is replaced in the reservoir by water. An active water drive maintains an almost constant reservoir pressure and oil production through the life of the wells. The amount of water produced from a well sharply increases when the water reaches the well. The recovery of oil in place from a water-drive reservoir is relatively high. Secondary Recovery: This involves injecting water into the field through injection wells. It can be initiated before or after the natural reservoir drive has been fully depleted. The aim is to use the water to sweep some of the remaining oil to producing wells. A waterflood can recover anything from 5-50% of the remaining oil in place that would not have been produced using primary recovery alone. The actual amount achieved depends enormously on the properties of the particular field. Tertiary Recovery (Enhanced Oil Recovery): In some cases, where Secondary Recovery still leaves a significant amount of oil in place in the reservoir, enhanced oil recovery may be effective. Enhanced Oil Recovery (EOR) includes thermal, chemical and miscible gas processes - injecting substances into the reservoir that are not naturally found there. Secondary Recovery techniques have been widely used since the early days of the industry. They are already in place in almost all fields where it is necessary or effective. The history of Tertiary recovery also goes back more than half a century. Tertiary Recovery, however, is only effective for a narrow selection of fields and involves substantially higher costs and effort. In their 1986 assessment of the world's 500 "Giant Oil and Gas Fields", Carmalt and St John  ranked Handil number 303 with an estimated 800 million barrels of ultimately recoverable oil. We can see that this 20 year-old estimate is very close to the mark in terms of the amount of oil produced with primary and secondary recovery (see Table 2). This should give us increased confidence in the Carmalt and St John estimates for other giant fields, including those in Saudi Arabia and other OPEC countries where current data transparency is inadequate. JPT: To maintain production and reservoir pressure, water injection was started in 1978 which maintained the 160,000 BOPD production until 1985. 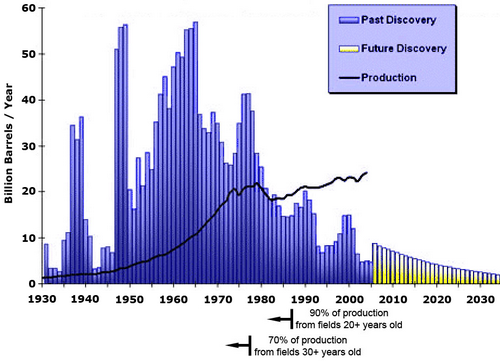 The production profile here presents a common picture of the lifecycle of a giant oil field. 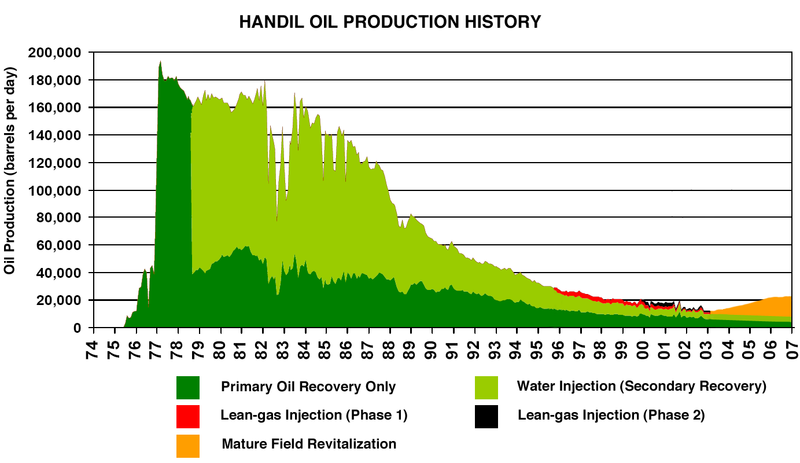 Secondary recovery (water injection) is used to maintain an oil production plateau for as long as possible before more significant decline becomes inevitable. After that, owners of the field have to decide whether intensive efforts to study, develop and apply tertiary (enhanced) recovery will recover enough additional oil to make it economically attractive. JPT: In November 1995 a lean gas injection project was initiated in five reservoirs. The project boosted the production of the five large reservoirs and altered the overall decline rate of the field. Therefore, the project was extended in 2000 to six other large reservoirs, which resulted in more than 25 per cent of the field reserves being under a tertiary-recovery mechanism. Oil extraction by miscible gas injection goes beyond conventional pressure maintenance by injecting a gas with specific properties, at pressures sufficient to create a highly mobile gas/oil fluid phase that swells and fills pore space in the reservoir rock. Compression energy from the surface pushes this miscible phase toward wellbores. Injected gas cannot be chemically reactive in the reservoir. Dynamic Modeling and Sweet Spot Mapping: Dynamic computer models combined with well logs and other static historical production data are used to identify the location of bypassed oil and smaller undrained areas of reservoir. Light Workovers (LWOs): Well interventions performed without pulling the completion at the bottom of the well. These LWOs are used to isolate water producing zones and target prospective new reservoir sections. Infill Wells: Where a Light Workover cannot be used because of the condition of the well, drilling new wells recovers the potential reserves in areas identified by Sweet Spot Mapping. Enhanced Oil (Tertiary) Recovery and Optimization: Miscible Gas Injection (described above), in this case using natural gas, is injected into the crest of the reservoir and attempts to sweep oil that has been bypassed toward the producing wells. JPT: In 2005, 26 LWOs were performed, of which 19 were successful. The project resulted in 1.7 million STBO (stock tank barrels of oil) production during the year and 4 million STBO of incremental reserves. The total cost was approximately USD 2 million. The stated costs for LWOs yield a figure of $2 per barrel added as reserves - very economical but the potential is of course very limited (production costs are in addition to this). The more expensive infill wells were used for shallow reservoirs with heavy oil, or multi-lateral wells to target multiple small reservoirs which did not justify single wells previously. Hopefully it is clear that what is simply described as 'Mature Field Revitalization' comprises many years of technically challenging study and modeling followed by intensive application in the field. For the engineers and geologists involved this was no doubt rewarding work. While all of these activities can be considered the application of 'new technology', only the final step is considered Enhanced Oil Recovery. JPT: These key elements increased the production from 12,500 BOPD in 2003 to 23,000 BOPD in 2007. For a substantial investment of time, money and effort in the giant Handil oil field, we gain just 10,000 barrels per day of oil production. Yet this case study has appeared in the Journal of Production Technology because it is a prime example of what can be achieved (the two other case studies in the same issue showed only very mediocre gains). While there will be isolated fields that perform better, there will be many more that fail to make the pages of the Journal of Petroleum Technology because they provide far less spectacular returns. In many cases, after intensive appraisal and assessment the schemes never get off the drawing board. An aspect of EOR that is seldom discussed is that recovery processes target oil fields with highly specific properties of reservoir rock and fluids. In brief, EOR processes are not universally applicable. With long years of research and field trials, the industry has developed two categories of EOR success. The vast population of oil fields with light oil and good permeability generally have not responded to EOR efforts [because Secondary Recovery alone is already highly effective]. TOTAL would be pleased if their efforts with the Handil oil field can increase the ultimate amount of oil recovered by even 5% (40 million barrels) compared to primary and secondary recovery alone. A 10% increase in this case looks unlikely. The returns look pretty small when averaged across the world's oil fields, given that only a proportion of them deliver a reward for this kind of effort. While these aspects of 'advanced oil field technology' can increase production from particular oil fields, thereby attractively increasing profits for the owner, they do not significantly alter the picture of global oil resources. According to this relationship, in a production system with fixed and variable inputs, beyond some point, each additional unit of variable input yields less and less additional output. Conversely, producing one more unit of output costs more and more in variable inputs. In our case we have finite, bounded oil fields. Until the mid 1980s, discovery of new oil fields exceeded our consumption rate, so there was little need to increase recovery from existing fields. As the discovery rate declined, companies had greater motivation to extract more from their existing fields. While at first they found easy gains, in the last decade especially the amount of effort required has climbed and yet the returns are falling: is it any surprise that oil industry inflation is rampant? Oil field reserves may have 'grown' 10-20 per cent since the Carmalt and St John assessment in 1986, but we should not expect the next 20 years to deliver the same gain. 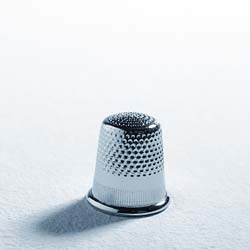 Discovery of new fields has tapered off to low levels and the easy pickings for increased recovery have already been had. Unconventional oil sources will yield similarly small returns for extraordinary amounts of effort. The numbers simply do not stack up for oil production continuing to expand for another decade against the decline in large mature conventional oil fields. In the case of the Handil Oil Field, a concerted campaign to revitalize the field almost doubled production from 12,500 barrels per day in 2003 to 23,000 in 2007. Yet this field had once produced nearly two hundred thousand barrels per day. This is a representative picture of the role of technology and enhanced oil recovery: merely extending the tail end of production in oil fields that are well past their own peak in production. So while the Society of Petroleum Engineers and other optimists tell us that technology and enhanced oil recovery will delay peak oil, a more objective look at the data suggests that production declines are relentless and they are stacking up much faster than incremental technological gains. Contact the Author or download this article as a PDF. and don't forget HO's wonderful Tech Talk series, which has just about every resource production and extraction topic one can think of. Denney, D. "Reviving the Mature Handil Field: From Integrated Reservoir Study to Field Application", Journal of Petroleum Technology, Society of Petroleum Engineers, Houston, January 2008. Hyne, Norman J., "Nontechnical Guide to Petroleum Geology, Exploration, Drilling, and Production". PennWell Corporation, Tulsa, Oklahoma, 2001. Carmalt, S. W., and St. John, B. "Giant oil and gas fields," in M.T. Halbouty, ed., Future petroleum Provinces of the World, Memoir, 40, AAPG, Tulsa, Oklahoma, 1986. This is a guest post from WebHubbleTelescope. As a good rule of thumb, when you have a promising model describing some physical process, you might as well put it through its paces. Not only do you shake out some stubborn corner cases, but you often find something new and revealing. We did that in the last post, The Derivation of "Logistic-shaped" Discovery, grinding out the derivation of the classic Logistic/Sigmoid-shaped Hubbert curve based on the generalized Dispersive Discovery model. With this post, I use the same discovery model to derive the upward climb of the cumulative reserve growth curve which we empirically observe on many oil reservoirs and oil-bearing regions. Update: WebHubbleTelescope has posted an updated version of this post here. Many analysts have found this reserve growth behavior both curious and ultimately very important. I know that Khebab and Rembrandt have spent much time on TOD tracking this behavior as it plays an important role in how the peak will play out. Furthermore, I believe that the practice of "back-dating" discoveries based on reserve growth updates has muddied the waters and stalled progress in the basic understanding of the fundamental growth process. Unless we have a good model for the reserve growth dynamics we have to resort to using the heuristics supplied by USGS geologists, including the modified Arrington equation that Khebab has successfully used in the past. I find nothing wrong with using a heuristic and Khebab has really kick-started the "un-back-dating" approach with some excellent results. Still, a heuristic lacks some of the predictive power and room for insight that a fundamental model can provide. The USGS crew have an interesting take on the reserve growth issue. In turns, the geologists working there have labeled fossil fuel (both oil and NG) reserve growth an "enigma" and a "puzzle". For that reason the United States Geological Survey (USGS) considers [this] analysis "arguably the most significant research problem in the field of hydrocarbon resources assessment." I have to admit that it has puzzled me for a while, but then again most of us here don't work at the USGS for 40-hours a week. This post runs though a stochastic analysis that essentially explains how reserve growth can happen. One of the technical issues that the USGS have struggled with respect to their reserve growth analysis involves the use of "censored data". This essentially says that you should take special care of extrapolating data backwards considering you have only a truncated time-series data set of recent vintage. The "sweet spot" for good data basically doesn't exist, with very few values for old data and also very few values for the latest data. Working with such a limited data set, they massaged it the best they could and adequately normalized the fractional yearly growth, but they basically punted after this point and came up with only a heuristic to "explain" the trend. Pragmatically, I've decided to sweep the censoring problems under the rug, since in the long term, complaining about the possibility of statistical shortcomings still won't explain most of the trend, which rises steeply enough to make the cornucopians hopeful for great prospects ahead (listen to any right-wing radio program today for examples of this kind of unbridled optimism). "We must accept finite disappointment, but we must never lose infinite hope." -- Martin Luther King Jr. Yet we still have left a riddle wrapped in a mystery inside an enigma. The actual problem with the half-baked reserve growth analysis has become obscured by the trickiness with using censored data. Wrapped inside, it really stems from a lack of a good value for the initial discovery estimate. Stating it bluntly, pick this number incorrectly and you can get numbers all over the map, with the possibility for some hugely absurd values. Note that at time t=0, the discovered amount starts at zero and then the accumulation reaches some value proportional to L -- what one should consider as the characteristic depth or volume of the reservoir. It takes time=T for most of the search to reach this point. The basic premise of reserve growth and what USGS geologists such as Attanasi & Root1 and Verma2 frame their arguments on, has to do with the reserve growth considered as a multiplicative factor of the initial estimate. They see numbers that reach a value of nearly 10x after 90 years and claim (perhaps implicitly) that this has some real physical significance, almost offering up hope for still-to-come huge reserve benefits. Figure 1 exaggerates the claim for effect, as I want to make you aware that a finite asymptote certainly exists, but it gets obscured by the data trends commonly reported. Figure 2: Trend duplicated from the A&R data. The blue '+' symbols represent the data and the red curve represents a small-window moving average. To generate the curve correctly, you must normalize the yearly growth per reservoir, as the reservoir sizes vary widely. The latter equation obviously starts at 1 and reaches an asymptotic value of 1+2T/A. Both the values of A and T describe the ultimate asymptote, but the non-zero A serves to avoid generating a singularity at the origin. For T= 24.6 and A=6.6, the figure to the right shows the negligible differences between using an integration window versus assuming a delta shift in the first estimate. The two curves essentially sit very close to one another. So what do these numbers mean? Essentially, A=6.6 means that the first discovery estimate on occurs on average 3.3 years after they first made the discovery. This makes intuitive sense because if we make the estimate too early, we end up with the equivalent of a thimble-full of oil. For T=24.6, this means that it takes about 25 years for the majority (i.e. the fast part) of the dispersive search to take place. The rest of the long tail results from the slower dispersion. The curve does eventually reach the asymptote for a cumulative growth factor of 8.5. In terms of a spreadsheet, you can turn the CGF formula into a discrete generating function, with the yearly estimates based on the growth factor of the preceding year. I plotted the curve directly against the A&R data in Figure 3 and Figure 4. After the hairs on the back of my neck settled down, I realized that this simple formula has some nice understandable properties. It essentially generates growth factors based solely on the maximum entropy dispersion in the underlying model. In other words, the "enigmatic" reserve growth has turned from a puzzle into a mathematical result resulting solely from simple stochastic effects. Figure 4: Fit to cumulative reserve growth of the A&R data. This was calculated from the generating function in Figure 3. This correlates well with the direct use of the reserve growth equation. Plotting the same data against an Attanasi & Root chart in Figure 5, it lays cleanly on top of it, showing discrepancies only on some very old outlier data. A&R went through the rationale of discounting the outliers, but I consider all the data valuable, if it gets used in the context of a decent model. Figure 5: Fit on top of the original A&R chart duplicated from Reference 1. The blue line comes from the Dispersive Discovery reserve growth model. To top it off, this heuristic shows unlimited growth! Do you suppose that the USGS geologists figured out that by reserving judgment on the possibility of an asymptote, that they could pawn off a fast one on the public, and defer the reality for years to come? You have to ask yourself how these professionals get away with publishing stuff based on hacking and punting, that really has such a simple statistical and mathematical underlying foundation. I really find nothing complicated about the mathematics (even though it has taken me some time to arrive at my current state of understanding). I call this combination of using simple models and using straightforward calculus and probabilities a form of pragmathematics -- just something you do to understand the physical foundation for the data we observe. Referring again to the literature, you find hints that support the dispersive effects of accumulated reservoir estimates (note that they use the term dispersion). A graphic illustration of the very broad URA data dispersion that occurs when grouping fields across geologic types and geographic areas was provided by the National Petroleum Council (NPC) and is reproduced with minor modification in Figure FE5. I claim that this new dispersive discovery reserve growth model has the potential for filling in the back-dated discovery curves and providing better estimates of future production levels. I would recommend starting with the USA data and using Khebab's approach for regenerating a profile of un-back-dated discoveries and then applying the Oil Shock Model to estimate extrapolated production levels. It may take some time to sort out the mess, but we likely have all the pieces necessary to formulate a complete model-based projection. The actual enigma of reserve growth I think has to do with the cluelessness of the USGS and the secrecy and inscrutability of the oil industry. You would think they would have figured out the reserve growth puzzle long ago. I guess they thought that deferring the reality would surely provide us with infinite hope. A fraction of the population thinks that oil production remains a simple matter of turning the spigot clockwise to get more oil, and reserve growth a non-issue. And that raising the current reserve inventory becomes a conservative decision made entirely under the control of humans. Overestimating the size of a reservoir has significant financial advantages. You can attract huge initial investment capital if you exaggerate a claim. But this can also attract charlatans. So I agree with the SEC's decision to put the stops on that practice, with big fines for fraudulent claims. And thus the oil companies tried to make their reserve estimates as high as they could without overdoing it. But they still had no good ideas on how best to characterize their estimates (not smart? who knows?). Some people suggest that the industry just makes "conservative" decisions. Yet, I don't think that ambiguously-framed "conservative" decisions matches with well with what you can accomplish with a good reserve growth model. I would describe the industry's approach not "conservative" but "non-predictive" and "safe". I can point to lots of other engineering areas where through the routine process of characterization one can make equally conservative estimates, but they do an excellent job of predicting the asymptotic behavior with safety margins for any errors or noise that creeps in. As an example Andy Grove was the first to characterize silicon dioxide growth by evaluating simple models and thus began Intel. Getting oxide thickness correct could follow a process where someone checks the thickness every two minutes like they were watching a loaf of bread rise, but the technology and modeling has gone way beyond that now in Silicon Valley and China. Not so with the oil industry however; to the untrained eye it looks like they use the primitive trick of plunging a thermometer into the turkey roasting in the oven. This is safe but, jeez, how primitive! Bottom line, I believe the current industry estimates for reserve growth remain just as safe and non-predictive as a turkey thermometer, but that the underlying reality (having to do with the dispersion of searches through the volume of a reservoir) can vastly improve our educated guesses. This makes it potentially predictive if the industry had the balls to use a good validated model. The simple model I use for reserve growth is complementary to what Andy Grove did in the 60's. Unfortunately, I also don't think that petroleum engineers have any control over marketing decisions. It's possible that oil industry engineers knew about the characterization outlined here all along but were superceded by management's decisions. They used it in their own internal books and presented a "safe" facade for the outside world. Unfortunately, we turned the clock to a new century, and some nobodies on TOD have finally figured out the obvious that had stared at them and the USGS in the face for years. 1 Attanasi, E.D., and Root, D.H., 1994, The enigma of oil and gas field growth: American Association of Petroleum Geologists Bulletin, v. 78, no. 3, p. 321-332.